Dog licenses for 2018-19 may be obtained from the Town Clerk’s office. All dogs over six months old must be licensed. Last year, 2,769 dog tags were issued. Fees for dog licenses are $8 for neutered male or spayed female and $19 for male or female. There will be a $1 penalty per month for renewal licenses issued after June 30. “A $75 infraction will be issued for any nonlicensed dog and for any dog not wearing a current dog tag attached to a collar around its neck or body,” Strauss said. Dog licenses are available at the Town Clerk’s office, Room 105 in the Town Hall, 110 Myrtle Ave., Monday through Friday, 8:30 a.m. to 4:30 p.m.; or by mailing payment and required certificates (all certificates will be returned with license), along with a self-addressed stamped return envelope to: Westport Town Clerk, P.O. Box 549, Westport, CT 06881. Licenses being sold will cover the term from July 1, 2018 to June 30, 2019. The Westport Library’s 26th annual Summer Book Sale will take place under the tents on Jesup Green from July 14-17. This year’s sale will coincide with the 45th annual Fine Arts Festival, a nationally ranked art show featuring 175 booths of juried artists in 11 categories, created by the Westport Downtown Merchants Association. The book sale will feature thousands of discounted books and other items in over 70 categories from A to Z. Categories and their subcategories include art, children’s, education, graphic novels, fiction, foreign language, gardening, health, history, home, humor, law, literature, maker-handcrafts, music, mystery, nature, performing arts, photography, poetry, religion, science, sports and travel. In addition to books, there will be DVDs, CDs, vinyl and audiobooks. This year’s sale will feature a number of rare finds, including a signed first edition of John Steinbeck’s “The Pearl” and Jean-Michel Basquiat’s 1985 Zurich exhibition catalog signed by the artist. Sale hours are July 14, from 9 a.m. to 5 p.m.; July 15, 10 a.m. to 5 p.m.; July 16, 9 a.m. to 5 p.m. (everything half-price); and July 17, 9 a.m. to 1 p.m. (contribution day — suggested donations of $5 per bag). Due to the ongoing construction at the library as part of its transformation project, the sale will take place exclusively on Jesup Green. On Saturday, visitors may create their own book art. Throughout the day, visitors are encouraged to stop by a unique book art station and experiment transforming paperback books into new works of art with a workshop on some basic book art techniques. All proceeds from the book sales directly benefit the library. It takes more than 300 volunteers to make the sale a success. Those interested in volunteering can email Suzy Hooper at shooper@westportlibrary.org. Both the Fine Arts Festival and the Book Sale are rain or shine and free to the public. For information on the Westport Fine Arts Festival and to find out how to get involved, visit westportdma.com. To learn about the book sale, visit westportlibrary.org. Westport residents William Nolan, William Overton and Christopher Severini graduated from Gettysburg College on May 20. Alyson Rackson, of Westport, graduated from Colgate University on May 20. Eric N. Zurmuehle, son of Francoise Arnold and Marco Zurmuehle of Westport, graduated from Hamilton College on May 20. 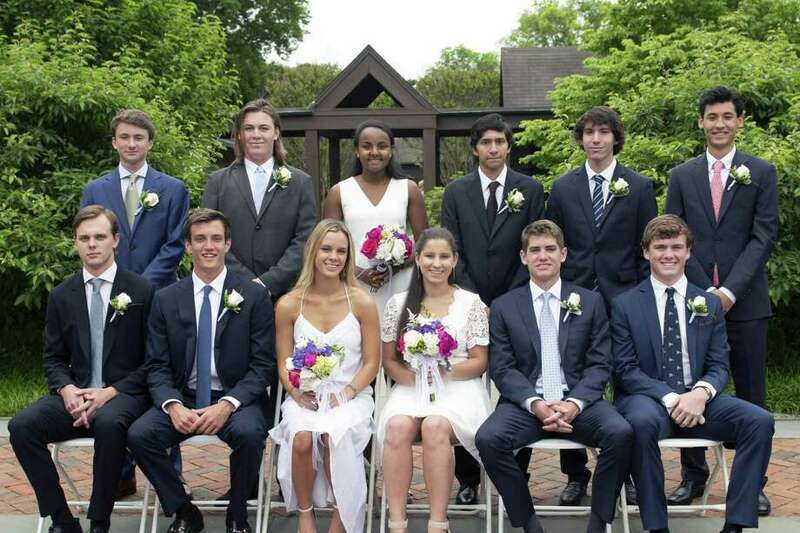 Westport residents Joshua Popkin and Sam Hahn graduated from Bucknell University on May 20. Westport residents Alexander Gandolfo, Hilera Hardy, Moira Margolis and Emma Mikesh graduated from Marist College the weekend of May 18. Aaron Greenspun, Kathryn Pfefferle, Mary Purcell, Dylan Schattman and Yasmin Zarrinfar, all of Westport, recently graduated from the University of Vermont. Harrison Feldman, of Westport, graduated from St. Lawrence University in New York on May 20. Alexander Frawley and Thomas Ward, both of Westport, graduated from the University of New Hampshire in May. Bryan Schiavone, of Westport, earned a bachelor’s deree from Wesleyan University on May 26. Shelby Cataldo, of Westport, recently graduated from the College of William & Mary with a bachelor’s degree.